If there is one thing Toledo has, it is a thriving artist community. In collaboration with The Toledo Symphony and sponsored by Promedica, the Toledo Arts Commission is presenting a three-day festival of the arts along the up and coming Riverfront downtown. One artist whose work has been woven into the landscape of the Glass City is Yusuf Lateef, who, in partnership with fellow artist Julia Labay Darrah, will be presenting an interactive piece during the Momentum festival next month. Yusuf Lateef’s artistry is inspired by life around him and he creates using a variety of media from paint and chalk to music and sculpting. If you’ve ever attended one of his exhibitions, you may recall seeing scenes, images and abstracts illustrated onto doors, frames, chairs and more traditionally, canvas. His remarkable eye and pensive approach to his work can transform the most unassuming item into a masterpiece, and may illustrate a story, raise awareness about a cause or advocate for someone whose voice may have been muted. Lateef’s artistic abilities are coupled with philanthropy which has allowed him to create thought- provoking murals throughout Toledo that have revitalized areas where abandoned buildings, which had sat empty, are now occupied with new businesses. This collaboration was solidified by the artists’ connection as adjunct professors at Bowling Green State University, where both obtained their master’s degrees in Fine Art; Darrah as a sculptor and Lateef as a painter. artists. There are many challenges to supporting a family while having an arts practice. “I feel like, in some ways, those challenges work in our favor. I think it makes us more empathetic to what’s happening in the world in small familial ways as well as larger social aspects.” said Lateef. Their piece embodies the creative drive that strives to recognize opportunities to see beyond the normal day to day. 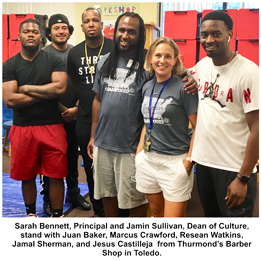 Yusuf Lateef’s work spans more than two decades, closely working with The Toledo Arts Commission, Young Artists At Work (YAAW) and Radiant City Arts, utilizing improvisation, creative writing, music production and visual arts workshops to inspire youth to explore and express their artistic gifts. Most recently, Lateef completed a mural project for the Parkridge Community Center in Ypsilanti, Michigan in partnership with the Youth Arts Alliance, founded by Heather Martin and was assisted by his nephew, artist Jalilurahman Lateef, who is the son of Imani Lateef, graphic arts designer. Young Lateef appeared at the unveiling of the mural, sharing his experience with attendees. During the project Yusuf Lateef worked with youth partners currently in the juvenile justice system to create a mural representing the pride and identity of the Parkridge community while mentoring area youngsters. The All Together Now interactive exhibition can be experienced during Momentum which runs September 13-15 and also features hot glass demonstrations along with musical performances, inflatable art installations, a tour of art in public places and closes with a Mini Maker Faire. The full schedule can be found on www.momentumtoledo.org and is free and open to the public. The Ninth Annual Scott Alumni Weekend – August 10 - 12!